Far far away from the Gift of Seed (or food) of the Vedic culture aka Anadanna or the highly sacred seed of the Andeans ancient cultures, we have chosen to show you seeds dressed up as a commodity for the global market, a mere product worth 25-28 $ Billions a year trade. That is the subject of this research. With just a few thousand US $ for the research paper you can find out the position of seed on the investment market in 2018. Traits refer to genes are been selected to be included in the new proprietary hi-tech seeds. Expect GMOs to fit into this category. Traits or characteristics such as herbicide resistance, shelf life for vegetables, high oil content for biofuels, are now “discovered” with gene marker technology, selected and inserted into other plants to become GMOs you find mostly in processed food as part of ingredients. One particularly sought after genetic trait may end up been leased for hundreds of varieties of vegetables, tubers, cereals or fibres, creating bonanza cash- windfall to the gene tech giants. 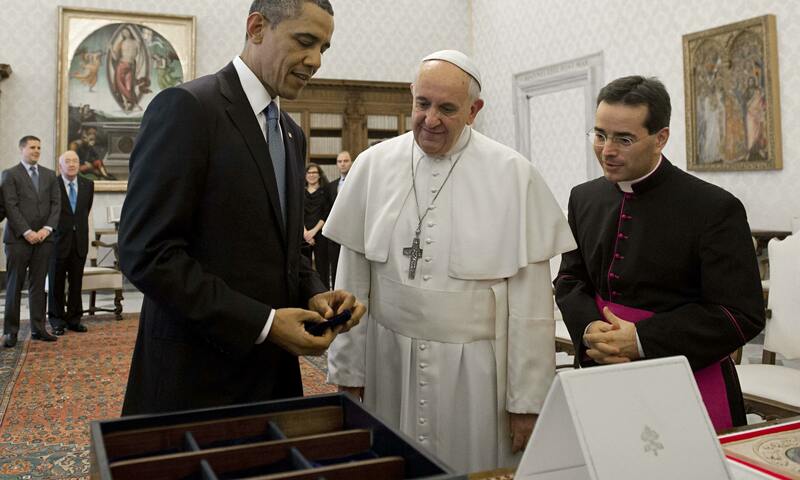 Is it Monsanto seeds that Obama is giving to Pope? The White House had been briefed in 2013 by the Seedsavers originals in Iowa that home gardeners whether at the President home gardens or in a black community gardens ghetto, only need to grow from home saved seeds to get nutritious home grown food. No doubt Obama was given the seeds by his wife Michelle who took the White House vegetables gardens as her pet project. It was good to hear the seeds Obama gave the Pope, were saved in his home garden. Monsanto breeders had nothing to do with it. No home gardeners ever need corporate seeds and the pesticides that come with it to grow good food. Hope you too trust the seeds that are given by neighbours or that you get at your Local Seed Network. Barack Obama seeks to sow seeds on common ground with Pope FrancisOn Thursday Pope Francis met a man who wields the kind of power and influence in his own country that many world leaders would envy. Before that, he found time to slot in the president of the United States.